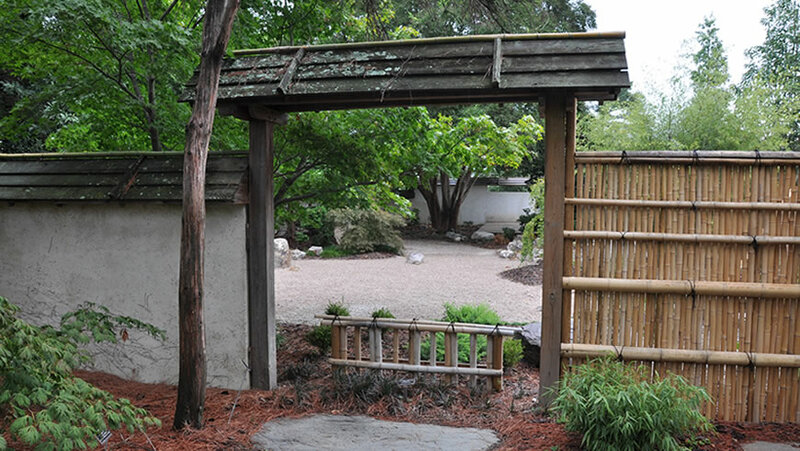 The Japanese Garden is one of many theme gardens designed and built by students, faculty, staff, and the green industry of North Carolina. The garden contains a wide array of Japanese plants and a large, raked-stone Zen garden of contemplation. Development of the garden began in 1981, with most of the initial plantings and structures being in place by 1987. The garden was completely renovated in 2010. Visitors cross a traditional wooden bridge constructed in a zigzag pattern, designed to keep evil spirits out. Continuing through mounded plantings, visitors soon emerge into an enclosed Zen garden of contemplation. From a viewing deck, several magnificent plant specimens are evident across a "sea" of raked stone. The scale of these plants is designed to provide an illusion of being on a faraway distant shore. All structures in the Japanese garden were built with respect for the wood in the true spirit of a Zen Garden, using only handcrafted construction without power tools.